The Arc of a Driver! Although short on numbers, our grid at the Morgan Car Club meeting at Donington, was certainly not short on quality with teams of 3 Astons lining up against 3 Lotus Elites, 3 Austin Healeys, a Healey ‘Frogeye’ Sprite, a Morgan +4, an AC Ace and an MGA. 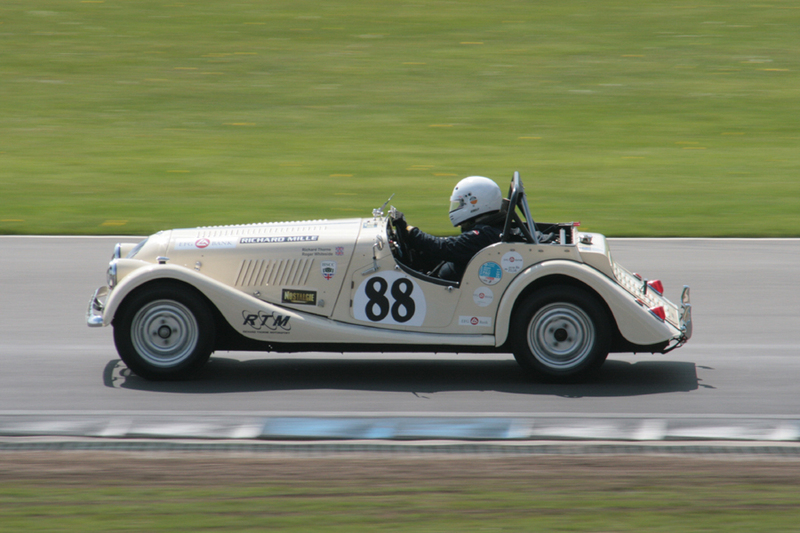 It was the first time out with FISCAR for Robin Ellis in one of the Elites, Richard Thorne in the Morgan and John Tewson in the Frogeye and it is very pleasing to note that we are still drawing in new drivers and their cars. Brian Arculus, unsurprisingly, placed his Lotus Elite on pole but alongside was Andy Shepherd in the AC Ace Bristol, hoping to make life difficult for the Lotus. Unfortunately, Andy was unable to take up his front row slot, as a seized rear brake required last minute attention, and he had to start from the pit lane. Worst was to befall Richard Butterfield, starting from row 3, as, sadly, he only got as far as Redgate before a halfshaft broke on his XK120, making his race a very short one. In the meantime, Arculus had assumed his customary place at the head of the field, easing away from a very determined chase by Jonathan Abecassis in his Healey 100/4. In fact, the first two places were to remain set for the rest of the race, with the Elite gradually drawing clear of the Austin Healey, which, in turn, pulled away from the chasing pack. Third place however, was hotly contested throughout and involved up to 4 cars. Initially, the position was disputed between the Elites of Robin Ellis and John Hilbery, and the Austin Healey of Andrew Dixey, but as Andrew started to fall away, he was passed by a hard charging Shepherd, howling the Ace through the pack to take up battle with the Elites. A little further back in 7th place, Tim Stamper was going splendidly in the first of the Astons, and whilst the rest of the field sorted themselves out, there was a lively dice between the Astons of Mark Campbell and Nigel Grice, and to which, with only 998cc, the Austin Healey Frogeye Sprite of John Tewson tried gamely to hang on. Nigel made an unsuccessful attempt to outbrake Mark which led to him having a grassy moment and whilst he was soon back on track, he was never able to recover the ground lost to the Campbell car. Andy Shepherd’s momentum with the AC seemed to surprise the battling Elites and he passed both of them in short order and initially started to draw away. However, Hilbery’s pace dropped off, allowing Ellis to concentrate on closing the gap back up to the Ace and lap by lap the Elite got closer to the flying Shepherd. Andy fought hard to keep Robin at bay but the inevitable happened when the Elite regained 3rd place and Shepherd had to settle for a well fought 4th place. Andrew Dixey finished 5th in his Austin Healey whilst Hilbery was the last to stay on the same lap as the leader to finish 6th. Tim Stamper’s fine but lonely drive netted him 7th whilst Richard Thorne, representing the meeting’s organising club finished 8th in the Morgan. 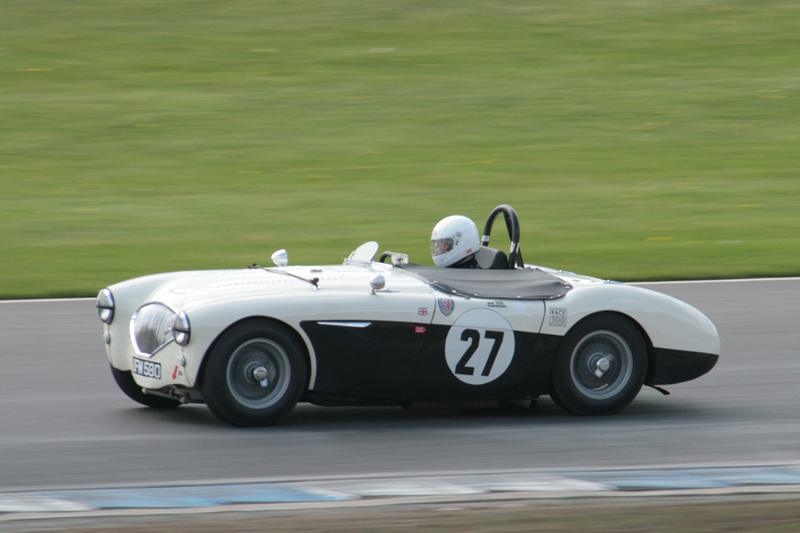 David Large brought his Austin Healey 100S home in 9th, whilst the top 10 was completed by the MGA of Andrew Moore. The battling duo of Robin Ellis and Andy Shepherd exit the Craner Curves and head into the Old Hairpin. Team winners this time were the Healey Hounds, followed by the Lotus Legends, British Bulldogs, and last but not least, the Aston team!